People of goodwill of every faith and nation must unite to ensure the triumph of religious freedom and of the "right" understanding of Islam, to avert global catastrophe and spare millions of others the fate of Sudan's great religious and political leader, Mahmoud Muhammad Taha, who was executed on a false charge of apostasy. The millions of victims of "jihadist" violence in Sudan -- whose numbers continue to rise every day -- would have been spared if Taha's vision of Islam had triumphed instead of that of the extremists. The greatest challenge facing the contemporary Muslim world is to bring our limited, human understanding of Islamic law into harmony with its divine spirit -- in order to reflect God's mercy and compassion, and to bring the blessings of peace, justice and tolerance to a suffering world. 'Gus Dur' as he is affectionately known, is quite an interesting character. 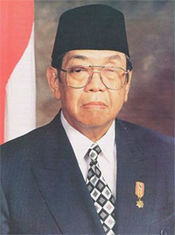 Former president of Indonesia, he was a nemesis of Suharto, and is an apostle of liberal Islam. That's right, an apostle of liberal Islam. Gus Dur is an advisor to the LibForAll Foundation, an organization that promotes a pop "musical fatwa" against Jihadism, among other things. It also promotes Sufism, which are often some of the most peaceloving and mystical sects to be found among any religion anywhere. This should come as no surprise - Indonesia is generally known for its very liberal and tolerant interpretations of Islam, and there is a lot of activism against the inroads of Wahabism going on there. The more you investigate Islam, the more it surprises you in a great many ways. Update: Publius Pundit knows him, and backs up the claim that he is a great guy.